Microsoft Live Labs announced today a new bookmarking tool called Thumbtack that allows users to collects snippets of information from the web, organize and share it with others. This is not yet another social bookmarking tool but more like to organize ones own web notes collections. There are so many apps to manage bookmarks but what is different in thumbtack? Thumbtack Faq says.. While there are several applications that overlap with functionality in Thumbtack, they all serve specific constituencies related to list making or note taking. 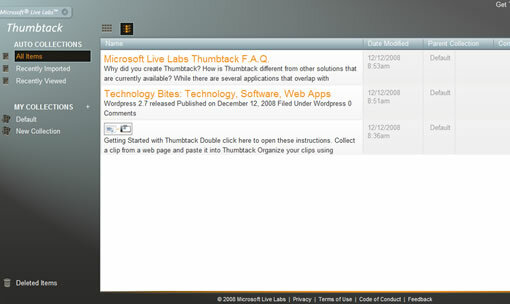 Thumbtack focuses on being a repository and crossroads for user collected content from across the web. It emphasizes the activities that follow the act of gathering â€“ archival, research, sharing and publishing. Thumbtack stands apart in its ability to introspect on incoming data in order to automatically classify it and extract structure from it using machine learning. Thumbtack users also have great flexibility in their ability to view, edit and annotate content in a variety of views. Canvas is a unique free form view that allows users to arrange content in arbitrary layouts for publishing or as a mind map. Create an account with Thumbtack to use the site, drag the bookmarklet to your browser bar and start collecting the notes. They provide bookmarklets for both Firefox and IE, finally Microsoft is recognizing Firefox or they already know the many early adopters use Firefox and not IE. Now whenever you want to collect a note just select the content and click on the bookmarklet bar, it will grab the text, images etc, but it won’t allow you to edit it at this point. You can enter tags, title and select category for the note. After saving you can access the note at any time, it preserves the original link so you can go back to the site later. Strangely it doesn’t show the links while grabbing the note, but it will show the links after saving it to thumbtack. You can’t follow the links embedded in the text by clicking, you should use ctrl+click to follow those links. It may be a bug but rather annoying, or thumbtack for the moment is a half baked product.